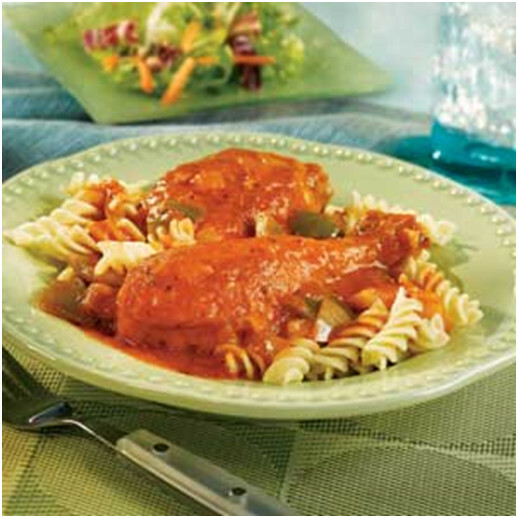 A saucy twist on chicken and pasta with some healthy, mouth-watering veggie goodness. Coat the chicken with the flour. Heat the oil in a 12-inch frying pan over medium-high heat. Add the chicken and cook in two batches until well browned on all sides. Remove the chicken from the pan and pour off any excess fat. Add the vegetable juice, oregano, garlic powder, pepper and onion to the frying pan and heat to a boil. Return the chicken to the frying pan. Reduce the heat to low. Cover and cook for 30 minutes or until the chicken is cooked through. Serve with the pasta.